Good morning friends (it’s morning here in Pittsburgh!). I am wearing Bvlgari Black today. Maybe it’s the suggestion of the bottle but I always feel a little biker chick when I’m wearing this one. It was my first “not super feminine” purchase and I need to wear it more often! Hi Neighbor! I am in Ohio! I have a bottle of this stashed somewhere. I need to find it now summer is over. Today, I am wearing Passion EDT. It’s more plummy and bitter than my EDC. POSH! How is it today Val? Wishing everyone a good start to the week! I’m wearing Dior Dolce Vida EDT. I love that bottle and box. SOTF (scent of the future) – finally bought Mito extrait today. I’m on holiday in Rome and rushed to Campomarzio the first day. They had to get a guy to bring it on a scooter from another location, and I don’t want to open it till I get back (no spillage!). So on the right I’m wearing Rubj extrait and the left has Lys Mediterranee. Also got some Maison Francis Kurkdjian samples so I have something to wear while in Rome. Lucky you Empliau…Roooommme, enjoy your trip! Good shopping there love and so sensible. I almost bought it (the Rubj ) but I’ve been wanting Mito forever and couldn’t afford both. I did love the Rubj though! Rome is wonderful any time but spring seems special. Visiting my daughter so win-win. If you asked me, which you didn’t, if I had had to make the choice between Rubj and Mito Extraits, I would have chosen the Mito. That bitter wake up right now and notice me opening, is to die for. Stunning. Wonderful buy. I wore Mito Extrait yesterday. Swoon. And so nice to buy it on a holiday and have a scooter story to go with it. Congratulations on your buy! Enjoy your time in Rome with your daughter. Fantastic day. You’ll always remember that purchase. Tonight I have on Lush Sleepy body cream, it’s really nice and not overpowering. I need to get my mitts on that! Shalimar EdC. Loving myself sick. Oh I wish I could try it…I bet it’s wonderful. Onda EdP. Bliss. For me Onda works best when applied very sparingly, just a mini spritz. Indeed. As I have mentioned before – I spritzed myself in 34°c heat, about 6 or 7 sprays, and went to a kindergarten fete. Nothing survived, neither kids nor bees. Hahahahaha. It is the only Vero I don’t own. I hadn’t realised you slightly oversprayed! But good to know that 6 or 7 sprays can be a worthy subsitute for pepperspray! If you ever regret not owning it, happy to decant as with the tiny amounts I will use I will never run out. I have been eeking out the last of a 5ml decant and FINALLY took the plunge and bought a bottle. PANIC bought, I should add. I would have definitely gone the triple spritz without this warning. Just returned from shopping. I had to have sprays in Dept Store ( It’s rude not to ) So…. One arm Hypnose….the other arm Gabrielle….Neck and chest Allure. Beautiful scents! Did any of them work well for you Marty? I like both Allure and Gabrielle as well. I’ve never sampled Hypnose and will next time when at Nordstrom. Allure is gorgeous!!! I wore it in the 90s. I could almost smell you from here! Oops. Have not mastered iPhone commenting. Delete/ignore. Good afternoon Portia! wearing Kiki Edp today and loving it. Kiki EdP – the only Vero I got a second bottle of. Under-rated but utterly fabulous. I bought the Mito extrait in Milan while at Esxence a couple of years ago when Very was launching Naja. She was so happy when I told her. So whever I wear it she is upmost in my mind. Also Val the Cookie Queen and Judith were with Jin and I so they feature heavily in my scent memories too. Vintage Vu by Ted Lapidus. I needed the oakmoss kick today. Love that. Wish I had mustered up the courage to ask my French teacher what she wore. She was extraordinarily beautiful and always smelled divine in the same fragrance. I just read that Vu is compared to Fath Expression. Do you find similarities? I also read that Expression has similarities to Sisley Soir de Lune, which I recently discovered and purchased a bottle that I’m enjoying. They share the typical 70/80’s chypre vibe. Vu is more yellow, flowery,with a bit of leather while Expression is more aldehydic, greener, even spicier. They both have a bit of honey and plenty of oakmoss. OMG these perfumes have such a wonderful depth…! I’ll compare it to Soir de Lune as soon as I’ll have a chance and let you know, Kathleen. I always loved this perfume. It’s forever on my wish list. YUM! I love this baby too. Hard as hen’s teeth to find. Lucky you. Wow, really? I see it pop up on Russian equivalent of eBay quite often. I’m having my first day in Nomade. It’s ever so gently green. I expected a bit more Oakmoss and oomph, given the notes, but this is sitting close to the skin. It would be good in a perfume averse workplace. I like it, and it’s refreshing that the creators put out something that’s not a sugar and vanilla bomb. For me it’s probably a bit too ladylike in some ways. Though to contradict myself immediately I think this would smell fab on a man. Will wear it tomorrow again and see if my nose picks up more from it. is it similar to any vintage or new perfume? Hmmm, I’ll think about that. It’s a very modern perfume I think, it doesn’t have the fusty aspect of vintage Floral Chypres. I love vintage chypre florals. 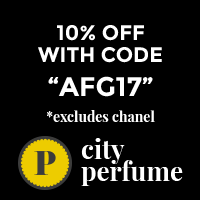 Chypre florals is probably my favorite perfume category overall. Yes, you’re right. Nomade is quite reticent but I think it changes the air around you more than you realise. It’s noticeable but not overbearing. Also it’s difference from so much else being released makes it a winner, good point. I need to test this because simple and pretty is what works for work…. quite a few scentphobes at my place of employment. That’s not easy. How do you deal with it? I go berserk at home!!! Luckily I don’t mind pretty and simple and I have plenty of perfumes in my wardrobe that fit the bill (Heaven, Brigitte, Reglisse Noire, Noa, eau de Lierre, Paramela, etc etc). The heavy hitters and challenging stuff I can wear on the weekend. Also, my skin eats perfume so heavy hitters like Casablanca one or two dabs sits close to the skin and the perfume adverse don’t complain. I sadly work with perfume adverse people as well. Hope the headache dissipates quickly. Penhaligon’s Malabah for me today. Good thing about 1000 Flowers is they are very reasonably priced. YUP! But they smell absolutely divine! I’m ordered and am waiting for arrival of 1000Flowers discovery set. We need to compare thoughts when sampling! I look forward to trying them. Let’s see what we think. Vintage Expression by Fath. After all this time it seems so similar to Vu I was wearing yesterday. I guess many notes are gone so it comes down to oakmoss, a bit of woods, a touch of spices and flowers. I should be using my vintages as a base for other lighter perfumes. Has anyone already done that? Yes I have in the past. You could pair a Chypre with a light citrus. Fath Vintage Expression is beautiful, I’m quite enjoying my mini bottle. I recently went crazy for Fath de Fath when sampled and purchased two bottles. I’m wearing it now and love it as much as anything I’ve purchased recently. Great, another vintage lover! I’ve never tried Fath de Fath. How would you compare it to Expression? Yes, I am a vintage perfume lover! They smell and feel so full and whole to me, not sheer and fleeting like many from today. Good question and I’m curious to sample them side by side today to get a better comparison opinion. They are both described as Orientals; I find Expression more green/woody chypre, and Fath de Fath more fruity and floral. Times are always a changing LOL! I’ve received a long-awaited package from my new scent friendfrom Moscow today, yay! It took it two (!) fricking weeks to arrive but it’s worth the wait: there are two dozens samples of vintage & niche perfumes. I’ve tried them all, of course, but am wearing Rose Privee by l’Artisan Parfumeur, and it’s just as good as I hoped it would be. Ha!!! ” I’ve tried them all of course”…. exactly what I would do. 😂 Enjoy all your new goodies!!! Neva, I will (it’s probably inevitable), just need to form a more or less stable opinion, right now it’s “OMG, they’re all fantastic!”. Right now I’m wearing a limited edition of Shalimar (a black bottle, I think it was made in 2007). It’s surprisingly good, got some vintage vibe about it. So enjoyable to have someone relatively nearby to share and explore with! I would be ecstatic to find more people that loved my loves. Hurray for finding someone Diana! I have one fragrance friend that I share my love of perfume and samples with and I am so grateful for her! Thank you, Kathleen! We’re very lucky, aren’t we? Seville a l’Aube today. It’s not lasting as long as usual – dry skin! Will have to respray when I get home. Drowning in decants and samples, so I’m going through and wearing a different one each day to decide what should go and what should stay. Yesterday I wore Serge Lutens Sarrasins. I have about 5mL left and it’s a keeper. Today I finished off a decant of Amouage Gold Woman. It would have been a keep if I hadn’t thunked it. Glad I got one more wear out of it. They are both beautiful perfumes. You smell great! So nice to see you here after being quiet for a while. All good where you are? L’art Saffran Troublant for me today. I love that one. You smell delicious , Melanie! Home now and am wearing and thunking Aqua di Sale. A dear friend of mine sent me a whole bunch of decants for my eldest as they both love “beachy” fragrances and she wanted mini Marzipan to experience some of her full bottle loves. Well, the eldest wore them at university and brought home just the dregs for me to sample and thunk. Night time ritual has been doing just that! and I will have several things to report on Portia’s Thursday Thunk post. I know this good friend lurks here from time to time so if she is reading I hope she will finally leave a comment-LOL!!! I would LOVE for her to be part of the APJ family! Acqua di Sale felt rather bitter on me. How do you like it, Brigitte? and speaking of friends, I hope Marcella pops in soon ! Yes, I miss Marcella and Jyotsna…I hope they’re all right and they’ll join us soon. Yep, we miss our girls. I remember you talking about AdS. It’s in my neverending “to-try” list. I hope you get to try it someday! Wish we all weren’t so far away from each other! This is true!! But it would be so much fun to exchange and test in person or without postal restrictions. Ha! Lots of packages mailed, eh? Hee hee….I already told her what a great bunch we are….. eclectic but so lovely…. And fun!!!! YAY! I love how you bring more friends in Brigitte. thanks. we love to grow the APJ family. Whoops, late out of the starting gate again. The weather has definitely turned and we are now seeing some cold mornings, with the temperatures down to single digits. For me, this means breaking out those heftier leather, woods, spice and amber frags. Monday was Jaipur Homme EdT. It’s not really a spectacular scent, but it’s very nicely done and it lasts forever; maybe 14 hours on me. Tuesday was HdP’ 1740. Whatever you might say about the Marquis de Sade, he had good taste in perfumes. I LOVE Jaipur Homme. Bought it for Varun (my last long term partner) who lives near Jaipur. He was so chuffed. I might get him another bottle if I go visit this year. My PPP arrived yesterday so last night I got started on Les Néréides. There wasn’t a name on it but one spray and I knew it was a patchouli bomb, so I had a reference point to start from. Further investigation found out that it’s called Patchouli Precieux. And it lives up to its name. This is a mentholated patch, there is a supporting cast but they’re hiding behind the curtains most of the time. All you get is an odd peek and maybe a muffled giggle. Today it’s Baikal Gris, intensely green, a little balsamic with a nod to swamp. I think I need to spray this to get the full effect. Enjoy your fragrant goods, Cassie! That patchouli sounds very good. It’s a really nice one, not dirty, more menthol and citrus. Wore Eau Absolu by Mona di Orio to work. Writing about Goldfield & Banks Pacific Rock Moss tonight so have some hefty sprays of that. Also, received Black Orchid and Oudh Cuir d’Arabie bottles today from a mates Sale doc so I have those on too. Casablanca early……Bal d’afrique now….Mr hurlets holiday later….or whatever it’s called !!!! I love that holiday one, by CB I Hate Perfume right? A water main broke right in front of the high school today, no school for my son, which meant extra taxi service for me today. But smelling good in Penhaligon’s Ostara. A shame they discontinued this one. I’ve been wearing the new version of Azuree by Estee Lauder for about 3 weeks. I love it! There is an oily citrus with a little floral in the heart that I can’t get enough of. I love modern Azures too. So dark and deep at the base. YUM! Love Azuree!!!! A gorgeous classic Estee Lauder that rarely gets mentioned. Wearing Florabotanica today, Brigitte style (lots of sprays) and not one compliment! What??? Not one compliment??? I say you smell amazing!!!! Mr. Hulot sprayed all over and thunk! See below….the eldest took the decant with her and brought back just a bit for me to test and Thunk. Mr Hulot didn’t get much time for his holidays in your house, Brigitte. Numerous sprays of Angel Muse, with two sprays of Patchouli Precieux over it to oomph it up. Yep, fairly fragrant here today. Lots of sprays seems to be the current trend here. That combo sounds great! It’s a great way to use things up!!! It’s all kinds of gorgeous. The extra patch gives it a new dimension. Giving Nicolai Cap Neroli another go today. So many raves for this on NST but there is something in there that makes it less than perfect for me, maybe the mint? I’m putting it up against Neroli Intense to see which 30ml bottle deserves my $ to fill my collection’s Neroli gap. White Sandalwood by Goldfield & Banks today. Sandalwood, rose and amber. Delightful for this overcast day. It sounds great, Melanie. I’ll be trying out the Goldfield and Banks perfumes next weekend at a local perfumery. Let us know which ones are your favourites. Emptied the whole sample of Saffron on myself this morning. Beautiful, but it has disappeared 😢 But at least I have one thunk this week. Nicolai Neroli Intense today. I need to dump my dabber into a small sprayer so I can give this an equal chance against the Cap Neroli. Dabbed it’s just not giving me enough to go on! Mendittorosa Nettuno & l’Ombre dans l’eau. Is there a perfume with iris/blackcurrant combo? Thinking of you and wishing you better times in the future Saffyishere. I hope your fragrances bring you some comfort. Virtual hugs to you Saffy. What an awful situation to be in. Sending you tons of warm thoughts, Saffy. Hang in there, please. Come back when you can, we’ll miss you. How awful…chin up Saffy and keep your calm. We’ll be sending you positive energy. Love and hugs!!! Well I have been lax in keeping y’all up to date. Today I sprayed myself in Tom Ford London. I had the nozzle misaligned and blasted my cheek instead of my neck. Lucky it didn’t go in my eye. Yesterday was Van Cleef & Arpels Pour Homme (modern version). I have three variants of this, and they are all good. Friday was a bit of a rare one: HdP’s Veni. Thursday was L’Artisan Tea For Two (pre-reform)., one of my favourite op shop gets. Wednesday I wore Versace Pour Homme. I decided I do not love this and it went to the op shop. VC & A Pour Homme is beautiful. You have three versions of it? How come? Splendiris. I must confess that I was a bit underwhelmed when I first tried it but wearing it on a sunny warm (finally!) day I started thinking that maybe I need a bottle of it. I’m always on the lookout for a new iris scent but the three contenders for the next FB purchase – Cuir de Nacre, Oriental Express and Nettuno – haven’t impressed me enough.